Lately the HR department started announcing seminars regarding financial matters. It's a good thing they have decided to have this type of seminars be conducted within the company. It only shows that they are concern for the financial well being of their employees. The email says the seminar is regarding on how to manage your finances. When I read that it was to be conducted by Colayco Foundation, I immediately told Jeff that we should attend this seminar. I have been a follower of Francisco Colayco's advocacy about financial literacy. 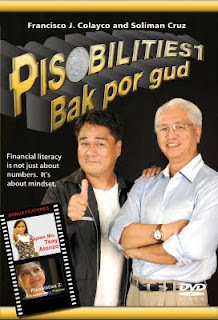 In fact I already had the books entitled "Pera Mo, Palaguin Mo". I have been reading it for a while and Jeff borrowed book 1 and it almost took 2 months but he was not able to fully read it. The seminar was scheduled for Thursday but due to some unknown reason, I decided to go home early that I forgot that there was a seminar scheduled by 6pm. Even the others forgot it. Good thing there was a second schedule of the seminar the following day. So we made sure that we will be attending this one sicne there are no plans of any Friday Night activity. Since the schedule was around 6pm and our shift ended at 4pm, we decided to have coffee at Starbucks at Eastwood mall. It's been more than a week since Jeff begging us to have coffee. He's collecting sticker for the 2010 planner. People tend to have a big misconception about borrowing money. They always think that its their right to borrow money. One example is banks tend to offer higher credit limit for clients who can pay their fees on time. Personal Finance consists of Earning, Planning, Saving, Spending and Investing. This has been a principle they have been implicating in the books. If you are planning on buying something, always ask yourself if you need it or want it. It is just a simple identification between necessity and luxury. Active income is income coming that requires our time, skill or services. While Passive income comes from sources wherein there is no effort from us. 1. Have an Emergency Fund equivalent to you 1 month salary. 2. Protect and/or secure your self. 4. Build up 6 months of cash reserve in case of unexpected unemployment. 5. Find additional/new sources of income.